A single mom in Pennsylvania may skip her family’s Thanksgiving dinner so she can start her holiday shopping early. A newly divorced dad plans on getting out at 6 a.m. on turkey day to buy gifts for his kids. A Best Buy worker in Iowa knows for sure that he’ll be missing his family’s celebration: He has to work. Welcome to Thanksgiving in 2014, a day that many lower- and middle-income Americans will spend either at work or out bargain hunting. Nearly 20 percent of people in households making $40,000 a year or less said someone in their family will be working on Thanksgiving, according to a HuffPost/YouGov poll conducted in November. That’s compared to just 11 percent of households earning $80,000 or more. Even if they could use the extra money -- retailers are typically paying time-and-a-half -- many say they’d rather have the holiday off. Employees at multiple retailers have written to The Huffington Post via email, Twitter and Facebook complaining about having to work on Thanksgiving. Shoppers looking for deals on the holiday also divide along income lines. Nearly 20 percent of people in households making less than $80,000 said they plan to shop at some point on Thanksgiving, according to the HuffPost/YouGov poll. That’s compared to just 10 percent of households earning $80,000 or more. While some stores like Walmart and Kmart have opened on Thanksgiving for years, recently more and more retailers have joined in. That means more low-wage workers are staffing stores and more stores are advertising “can’t miss” bargains. Increasingly, Thanksgiving is a holiday that only some can afford to celebrate. Infographic by Jan Diehm for The Huffington Post. Data from Brad's Deals. The Best Buy worker in Iowa said he’s realistic about the realities of retail work, like near-minimum wage pay and reporting for duty on Black Friday. But he started to resent cutting his holiday short once his employer began opening at midnight as Thanksgiving ticked over to Black Friday in 2012. This Thanksgiving, Best Buy is opening at 5 p.m. on Thursday. Best Buy told HuffPost that the chain tries to staff its stores with volunteers whenever possible on Thanksgiving. Employees who do work the holiday will get paid one-and-a-half times their hourly rate, Best Buy spokesman Jeff Shelman wrote in an email. 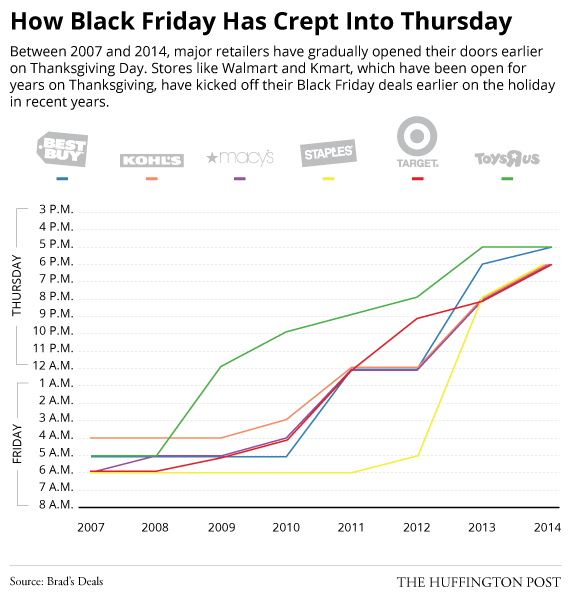 Most retailers open on Thanksgiving have similar policies. “Many employees want the premium pay and many like to be part of the excitement of the store opening,” Shelman said. “Millions of Americans have voted with their feet and shown that they want to shop on Thanksgiving evening,” he added. Linda Hutchinson, the 51-year-old single mother in Pennsylvania, may skip the three-and-a-half-hour drive to Thanksgiving at her sister’s house this year. She wants to make sure she has the energy to go out shopping after her turkey dinner. Heading to the mall on the holiday “allows you to get things that you probably wouldn’t get otherwise,” she said. When stores open or offer the best online deals on Thanksgiving day, it creates “enormous pressure” for shoppers trying to find affordable gifts for their families, said Nadja Gutowski, who started a petition last year asking retailers to stay closed on turkey day. About two-thirds of holiday shoppers live in households with an income of $50,000 or less, according to a recent survey from consulting firm PricewaterhouseCoopers. They’re particularly susceptible to Black Friday promotions because their shopping is largely restricted by affordability. Paul Driscoll said he always uses Thanksgiving to get deals on gifts for his six kids, ages 6 to 31. In past years, Driscoll has only gone out bargain hunting after Thanksgiving dinner, but this year the newly divorced dad said he plans to head to Kmart at 6 a.m. to get a jump on the sales. The 49-year-old, who works two jobs himself, said he’s sympathetic to the people who have to staff stores on the holiday. “It is unfortunate people have to work. I know the pay isn’t great,” Driscoll said. An Illinois Kmart worker, who makes minimum wage, said she was “shocked” when she looked at her schedule and found out she was working on Thanksgiving. She was planning to have about 10 or so people over for dinner. “I’m supposed to tell them now, ‘No, sorry, you’ve got to find your own thing to do,’” she said. The 54-year-old worker, who asked to remain anonymous to protect her job, said she was under the impression that seasonal employees and volunteers would be the only ones required to work on the holiday -- that’s how it’s been framed in the media by Kmart brass. Yet this worker sent HuffPost a photograph of a sign hanging in her break room telling employees they can’t request time off between Nov. 23 and Jan. 2. 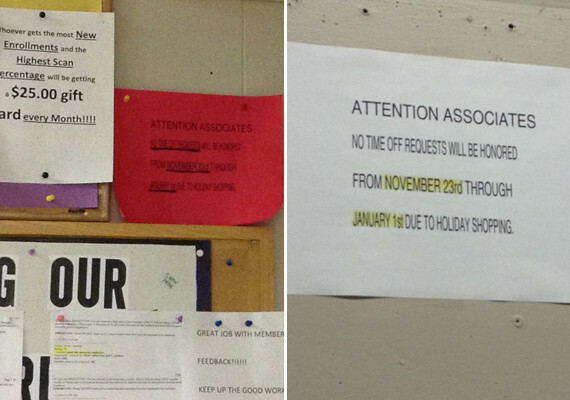 These signs telling workers not to request time off during the holidays were sent to HuffPost by a Kmart worker in Illinois, who said the signs were hanging in her break room and were later taken down. Kmart stores “do their very best” to staff the holiday with seasonal workers and employees who volunteer, a Kmart spokeswoman wrote in an email to HuffPost. The retailer also pays employees who work the holiday time and a half. “We make every effort to accommodate associate shift requests during this time,” the spokeswoman wrote, adding that the chain has been opening at 6 a.m. on Thanksgiving for four years and has received positive feedback from shoppers. This year, about 16 percent of employees said they will spend Thanksgiving at work, according to a survey from CareerBuilder.com. If lawmakers and businesses don’t take action, even more people could end up working on the holiday down the line, said Kate Bronfenbrenner, director of labor education research at Cornell University's School of Industrial and Labor Relations. That’s because many of the fastest-growing jobs, like retail, are characterized by low pay and unpredictable schedules. The HuffPost/YouGov poll was conducted Nov. 19-20 among 1,000 U.S. adults using a sample selected from YouGov's opt-in online panel to match the demographics and other characteristics of the adult U.S. population. Factors considered include age, race, gender, education, employment, income, marital status, number of children, voter registration, time and location of Internet access, interest in politics, religion and church attendance. Ariel Edwards-Levy and Hunter Stuart contributed reporting. UPDATE: This story has been updated to include the fact that the signs posted in the break room of the Illinois Kmart were later taken down.